Why Magnesium Glycinate? Magnesium is one of the most common deficiencies in current research and is a critical part of over 200 processes in the human body. Magnesium supplementation is suggested for many people, and can be especially helpful for improved sleep, improved mood (mild depression), muscle cramping, bone density and more. 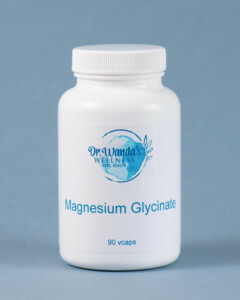 This form of magnesium, Magnesium Glycinate, is well absorbed and less irritating to the digestive system so if preferable to other forms of magnesium (those can cause diarrhea when taken in the dose that is recommended). Click here to read more about Dr. Wanda’s Wellness Magnesium Glycinate! Click here to access Dr. Wanda’s Research Library about Magnesium supplementation.